Frank Giannino, former record holder, passed the baton to Pete Kostelnick. Pete ran from San Francisco City Hall to New York City Hall in 42 days, 6 hours, 30 minutes, to set a new record. Photo by Zandy Mangold. Pete Kostelnick runs through Eastern Pennsylvania farmland en route to his Guinness World Record run across America. Photo by Zandy Mangold. Pete continues through Eastern Pennsylvania and fuels up for some more miles. Photo by Zandy Mangold. Unlike Forrest Gump, Pete Kostelnick shaved every Sunday during his Guinness World Record run across America. Photo by Zandy Mangold. Considering he ran 72 miles per day for 43 consecutive days, Kostelnick’s feet are in good shape. Photo by Zandy Mangold. Charlie Engle joined Pete Kostelnick for the final 35 miles. Photo by Zandy Mangold. Kostelnick pushes through New Jersey to the New York border. Photo by Zandy Mangold. Running down the Upper West Side of Manhattan, trying to make the 6pm finish deadline at City Hall, Pete is joined by local ultrarunners including Phil McCarthy, Camilo Martinez and Chris Solarz, along with RunningMan author Charlie Engel. Photo by Zandy Mangold. 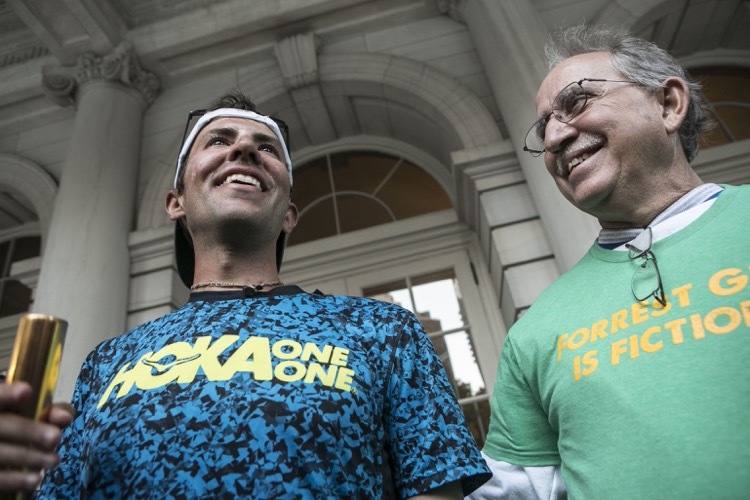 Kostelnick dodged all sorts of obstacles as he raced the final few miles to NYC City Hall. Photo by Zandy Mangold. A beer and my wife, that’s all he said he wanted after he finished. Photo by Zandy Mangold. Next Article Run As a Lone Wolf or Stay Back With the Pack? Way to go Pete! Nice work!